The substratum of politics is ideology. The Bharatiya Janata Party’s bedrock is the 93-year-old very Bharatiya Rashtriya Swayamsewak Sangh (RSS)—hate it or ignore it at your peril. The substratum of politics is ideology. The Bharatiya Janata Party’s bedrock is the 93-year-old very Bharatiya Rashtriya Swayamsewak Sangh (RSS)—hate it or ignore it at your peril. It is the only ideological force to capture the nation’s mind space and media space more than any other similar outfit. It owes its fame and name, and notoriety, not to its social work but the constant cannonade of liberals and seculars who deny any positive side to it. The spotlight is so erratic that the RSS attracts disproportionate attention for guest lists at its events. The invitation extended to former President Pranab Mukherjee to address over 700 RSS volunteers in Nagpur has grabbed more headlines and prime time debate decibels than the rampageous rise in petroleum prices. Pranabda, at 80, doesn’t need advice from anyone either to reject the invitation or confront the RSS for its philosophical position. The conscience keepers of Indian liberalism are convinced that the former President has betrayed the cause of inclusive politics by agreeing to share a platform with RSS chief Mohan Bhagwat, who presides over a “divisive outfit”. The massive outburst against Mukherjee’s choice is a sign of the reigning climate of intolerance and the politics of confrontation adopted by all political parties—including the BJP. For the past few years, political and social apartheid is rampant in Indian polity. In most organizations, democratic debate has been interred in the cemetery of calcified causes. The previous practice of fighting politically and feasting socially has been junked. New Politics promotes stupendous sycophancy, skulduggery, surrender and slavery. Insecure and arrogant leaderships have converted their foggily flexible fundamentals into physical boundaries which when crossed by even former patrons invite rebuke. Symbolism has never been so misconstrued and misappropriated. 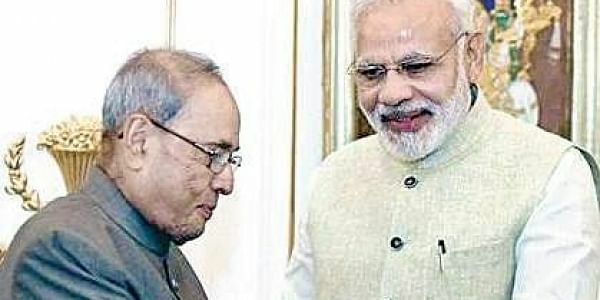 Even leaders of supreme stature like Pranab Mukherjee are not spared. Frankly, neither the RSS nor he needs each other to acquire additional credibility or acceptability. Both are veterans of many battles and brickbats over decades. Surprisingly, they have something in common: while the RSS was banned a few times and its leaders were imprisoned from the time of Nehru’s premiership to the Emergency, and disallowed from holding shakhas in public, Pranabda has faced unceremonious ejection from various political and government positions in the past. The Sangh has now grown into a towering titan. It holds 55,000 shakhas at more than 32,000 locations all over the country. Over 100 affiliated organisations, such as Bharatiya Mazdoor Sangh, Akhil Bharatiya Vidyarthi Parishad, and Vishwa Hindu Parishad run over 1,75,000 social and educational projects. More than 200 RSS-trained persons hold important posts in the BJP and the government. Almost all BJP chief ministers are from its cadres. Over two-thirds of the Union ministers, including the prime minister, have been full-time pracharaks. The president and the vice president of India have been actively associated with the RSS. Significantly, it has never invited a former prime minister, deputy prime minister or vice president to address its cadres. When the notables visit Nagpur, it is as ordinary swayamsewaks. Pranabda rose from an ordinary Rajya Sabha MP in the early '70s to the President of India in 2012. He has also been one of the RSS’s most vocal critics, both in private and in public. But, he is not a conventional politician who follows political apartheid. He has always maintained a good rapport with the BJP and the Left. He polled the maximum votes in the presidential elections, with almost all non-BJP political parties supporting him. In this warped age of polarized positions, where most politicians lack the ideological sophistication to comprehend the multilayered layers of democratic conduct, magnanimity is undermined by petty partisanship. At this point in Mukherjee’s life, a post that was once denied to him is unlikely to hold any fascination. Like most leaders with democratic pedigree, he is able to reconcile variant views since they are the veins that enrich the ore of democracy. He criticized the Modi government during the Gujarat riots, but didn’t miss an opportunity as the Rashtrapati to praise the prime minister as a quick learner. He swears by the Nehruvian model of governance and politics and swears loyalty to Indira Gandhi’s memory and legacy. None of these aspects have deterred him for expanding his social space since it is his daughter and son who are active leaders in the Congress party, not he. So, why are Congress leaders and liberals grumbling about his visit to the RSS headquarters, knowing full well that he is not one of those leaders who change their tone according to the place and opportunity? The RSS has truly taken a huge risk in inviting him. By giving him a podium, it has enhanced his political neutrality and would find it difficult to chastise him later for any critical views. When it comes to plain speaking, Pranabda ignores the predilections of his audience. He is not obliged to say what his audience wants to hear. He expects them to hear what he has to say. The RSS, too, needs course corrections in its perceptive treatment of minorities and rigid interpretation of Hinduism. Previously, too, it has opened itself up to social scrutiny and invited objective adversaries to speak to its cadres. For example, Jayaprakash Narayan, the legendary socialist who led the pre-Emergency anti-Indira campaign, was so impressed by the outfit that he declared, “If the RSS is fascist, I too am fascist”. Even Mahatma Gandhi has spoken well of it. According to nationalist publications, luminaries like Field Marshal Cariappa, former Vice President Dr. Zakir Husain and even Indira Gandhi have attended Sangh functions. Inviting Pranab Mukherjee is part of the RSS’s new strategy to minimize its untouchability among genuinely liberal and credible opinion makers. The RSS also invites media barons, corporate honchos and industrialists to its functions, though it is yet to call political leaders from other parties. But with Congress president Rahul Gandhi making the saffron mother lode his main target, the Sangh is attempting to neutralize his tirade by wooing former Congressmen to participate in impartial discourse. Rahul’s double-barrelled strategy of adopting soft Hindutva through temple hopping to regain lost Hindu middle-class trust and demonizing the RSS to retain its fading Muslim base has forced the nationalist body to look beyond the BJP for its future expansion. Just by hosting Pranabda at Nagpur, the RSS is unlikely to lose its staunch anti-Congress image. But his every word of wisdom uttered on June 7 would be heard with awe, attention and trepidation, and both political sides will look for subtle subtexts of reproach and resolution. It is heartening to see a former diehard Congressman defining the contours of future political alignments and realignments from the Maha Mandir of saffron ideology. It proves there is still healthy space left in Indian democracy for critics to be guests of adversaries. Ironically, it’s the most vilified Sangh that is in charge of the RSVP. Pranabda is a wise man.What ever he does he applies his mind. Let Zaffer Sharrif also be reminded ( who has written letter against Prnbda visit to nagpur) about his remarks about "RSS"on the occasion of 20th annversory of emergency- " I have never seen in my life any black spot in RSS"
We are no British! Please convey your thoughts in simple english. Please don't be Shashi Tharoor.